Celebrations are incomplete without Rakhi gifts, which make this festival unforgettable, at least for a year. Hence this store, which offers the plethora of gift options for rakhi shopping. The store is packed with everything that you need to celebrate thali, dry fruit thali, fancy rakhi, kids rakhi, Lumba rakhi, cakes, chocolates, sweets, hampers, dry fruits, soft toys, fruits, flowers and more. Coupon/Offer Details: Gingercrush is offering up to 50% off on t-shirts, water bottles, ceramic plates, mobile case covers etc. Coupon/Offer Details: Make this Rakshbandhan more lovable for your brother with exclusive rakhis, gifts and sweets from GiftingNation. Avail all the quality products at best price. Click activate deal to browse all the categories. Rakshabandhan is a holy festival of celebrating sibling love. Thought about surprising your sister this Raksha Bandhan? Not yet? 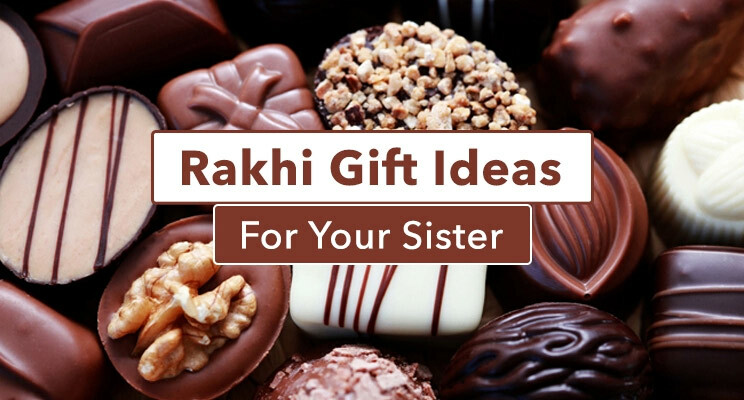 Don't worry, we got your back with ideas for Rakhi Gifts for sister. Read up! Thinking of sending a personalized rakhi to your brother? Check out this guide and know how you can surprise your brother this raksha bandhan! What Is Raksha Bandhan Festival And Why Is It Celebrated? Raksha Bandhan is one of the biggest festivals in India. Raksha Bandhan or Rakhi is a celebration of the loving bond between a brother and a sister. Raksha Bandhan literally translates to ‘the bond of protection’. During the ceremony, the sister ties a decorative thread on the brother’s wrist and asks for his protection and care. In return, the brother gets his sisters gifts and presents. The festival is celebrated primarily in the Indian sub-continent. During Raksha Bandhan, all of the major online sites, as well as offline stores, provide hefty discounts and raksha bandhan offers. Rakhi offers are available on all gift items, from electronic gadgets & mobile phones to fashion apparels, cosmetics and makeup kits, food and sweets, and more. Shop during the festival and make use of the rakshabandhan offers to buy the desired gifts. According to the Hindu Calendar, Raksha Bandhan is celebrated on the full moon day in the month of Shravana which generally coincides with August. The dates, however, vary from year to year and Raksha Bandhan 2019falls on 15th August. 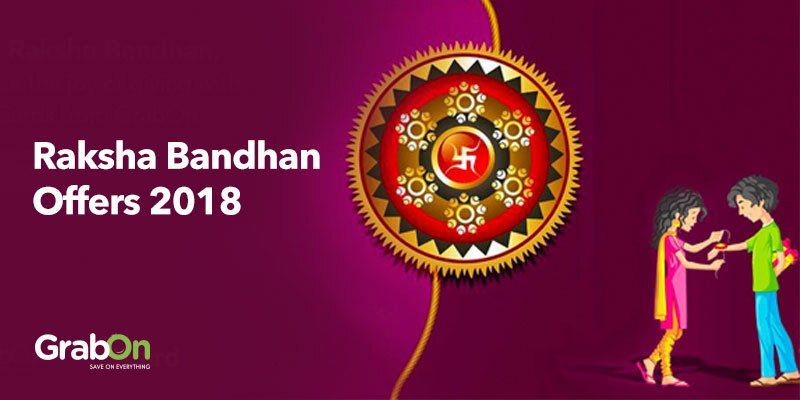 During Raksha Bandhan 2019, you will find amazing rakhi offers and deals from online shopping sites that you can avail while buying gifts for your brother and (or) sister. You can choose from a wide variety of options when it comes to gifting like chocolates, dry fruits, flower bouquets, gift hampers, customized gifts like coffee mugs and photo frames, fashion apparels, jewelry, home decor, smartphones and other electronic gadgets, and more. You can also use the rakhi offers 2019 available on flight bookings and purchase a ticket home! Jabong Rakhi Offers 2019: Bring It In With Your Sibling! Shop and get a chance to win gifts like iPhone 7, Series 3 Apple watches, bluetooth speakers and more from brands like Daniel Klein, Bolt, Energy Sistem, Caprese and Swarovski. Avail upto 40% OFF on brands like Biba, US POLO ASSN., W, Lacoste and more. You can also buy gifts like contemporary jewelry, stylish watches, smart backpacks, makeup kits etc. for your sibling. Choose from chic rakhis starting from Rs 500! This Raksha Bandhan offer your brother or sister unconditional love with same day express delivery of rakhis, chocolate combos, cakes (also eggless) and flower gift baskets & hampers. You can get the rakhi(s) gifts delivery worldwide to countries like USA, UK, UAE, Canada, Australia, New Zealand, Indonesia, Malaysia, Saudi, Ireland, Singapore and more. Apart from express delivery of rakhis you can also avail offers on sets of rakhis (3, 4 or 5), and send rakhi gifts for brother, bhaiya bhabi along with cosmetic and spa gifts, saree gifts, fashion accessories, and more. Visit Flipkart’s Rakhi store and choose from set of rakhis, rakhi combos, scented rakhis, bracelets, silver and gold rakhis, thali and incense stick puja sets, gadgets, customized coffee mugs, gifts for kids, e-gift vouchers and raksha bandhan gift cards to send to your beloved sibling. You can purchase e-gift cards for your dearest brother and sister from a wide variety of categories like gift cards for the trendy siblings, tech-savvy siblings, social siblings, and adventurous siblings. You can also buy physical gift cards which you can then get delivered within gift boxes. Avail massive 25% OFF on brand vouchers from stores like BookMyShow, Shoppers Stop, MakeMyTrip and more. You can choose from traditional kurta pyjama under Rs 999, lehenga selection available at minimum 50% OFF, rakhis under Rs 499, quirky gifts, fashion accessories, premium pens at 40% OFF, toys and games for kids, and more. If you buy 3 or more items, you can avail an extra 10% OFF (discount of upto Rs 300), just use the code ‘B3G10’ to enjoy the offer. Pay with HDFC bank and get an additional 10% instant discount on your order. You can choose from stylish kurtas, trendy shirts, fashionable dresses, latest smartphones, and smartwatches, in vogue ear cuffs and earrings, beautiful bracelets, electronic gadgets like hair straighteners, cameras, speakers, headphones, coffee makers and more. Purchase rakhi from IGP and get it delivered online within the same day using express delivery. You can also opt for next day delivery. You can choose from assorted chocolate and rakhi sets, assorted dry fruit baskets and rakhi sets along with designer rakhis, rakhi sets for bhaiya bhabhi, and other gift baskets & hampers. Missing home on Raksha Bandhan? Well, book a flight home! Worried about the prices? Book flight tickets at FLAT 6% OFF with MakeMyTrip and surprise your sibling! You can choose customizable gifts from brands like Mahi. You can choose gifts depending on the age of your sibling. There are various gifts for age groups: 0-7 years, 8-16 years, 17-23 years, 18-32 years and finally 32 years and above! Select from rakhi sets starting at less than Rs 250. With a variety of categories like gold plated designer rakhis, gold plated kundan rakhi, bracelet rakhis and more, you will never run out of fun options! The rakshabandhan you can ditch the old chocolate and dry fruits and go for something in trend like the latest smartphones from top brands like Apple, Samsung, Motorola, Huawei, OnePlus, Oppo, Vivo and more. You can also gift smart home devices like Amazon Echo and Echo Dot or Google Home. Sound systems and speakers or earphones as rakhi gifts are a good option as well. Avail the ongoing rakshabandhan offers on mobile phones and electronic gadgets and get your sibling something special, this rakhi. Fashion apparels, jewelry, and accessories are evergreen rakhi gift ideas. Fashion houses like Flipkart, Amazon, and Snapdeal are offering great deals and amazing rakhi sale where you can choose from a wide variety of fashion apparels across multiple well-known brands. You can avail discounts on skin, hair and body care products from Biotique or get makeup kits for your sister. If you are looking for jewelry, then Bluestone has you covered with mouthwatering deals on jewelry buying and making charges. Raksha Bandhan is here but you are still not sure what to get your sister (brother)? Well, let us help you. Rakhi gifts are something that should remind your sister (brother) of the lovely moments that you had and continue to have. They need not be extravagant or costly. For starters, you can get them customized gifts like coffee mugs, pillow covers, smartphone cases or photo frames using an old family photo that you both can relate to. Next up, you can get them something they are in need of, it can be a new wardrobe refresher clothes or a new smartphone. How about a Bluetooth speaker or even a laptop, because a sibling in need, is a sibling indeed. You can also go for something a little more DIY (Do It Yourself). There are lots of rakhi making tutorials on YouTube which you can use to make a rakhi all by yourself from the scratch. These are some rakhi gift ideas, but at the end, it's your brother or sister you are gifting and you know their needs and preferences better than anyone else. Ditch The Rakhi Gift Hamper And Go The Gift Card Way! You will find plenty of amazing rakhi deals and offers that are available on rakshabandhan gift hampers like flower and chocolate combos or bouquets and more. But think about it, is there something that you can get them which they can use to buy or do something that they love? Well, the answer to your question is Gift Cards. Gift Cards from GrabOn lets you do just that. If your sibling is a fashionista, then get them Shoppers Stop or Myntra Gift Card. If they love movies then BookMyShow or PVR gift cards will be perfect. If they love smartphones, electronic gadgets and accessories, Amazon or Flipkart e-gift cards will be your go -to! Don’t break your head over finding the perfect rakhi gift, the gift cards from GrabOn has you sorted. This rakshbandhan don’t forget to use the best deals and amazing offers to get the perfect rakhi gift for your sister (brother). With tons of raksha bandhan coupons and rakhi offers available on a wide variety of products, you can easily choose to get something that your sibling would love and adore. Rakhi Gift Offers On Entertainment, Mouthwatering Food, And More! If you think, the rakhi offers and deals were available only on fashion and smartphones, then you are mistaken. You can avail the best raksha bandhan offers on ordering delicious food online. That’s not all, you can also enjoy discounts on entertainment options like booking movie tickets and other social events held during the festival. During Raksha Bandhan you can avail offers and discounts while paying through bank debit and credit cards or mobile wallets. Select the bank or mobile wallet payment option that you want and narrow down on the rakhi gift choices that you want to purchase. How To Use Raksha Bandhan Coupons To Avail Discounts While Shopping Online? Visit GrabOn and type for Raksha Bandhan in the search bar. Click on ‘Show Coupon Code’ or ‘Get Deal’ to activate the Raksha Bandhan offer. Apply the coupon code on checkout to avail the discounts. The love between siblings and mostly a brother and sister edges more on harmless fighting sessions and arguments. And still, it is for sure that no love is lost between the two. Raksha Bandhan is the time to show that extra love, to make up for all the fights and shower each other with lovely and exciting gifts. This is the best time of the year to settle all the differences between squabbling siblings. Be it the rakhi, chocolates or any other gifts, that little something says a lot about your love for your brother or your sister. And moreover, with all the Raksha Bandhan gift coupons and offers available online, gifting will definitely be easy on your pocket. Its high time that you start shopping now. Along with the vow to stand by your sister throughout her life, get some really cute gifts for your sister this rakhi. It need not necessarily be heavy on the pocket. You can make your choice from the wide range of products that are available online. The benefits of buying gifts online for your sister are more than one. You need not plan in order to find time out of your busy schedule. You can easily order something special from the comfort of your home or the office, or simply any place you are in. And then, you have the option to save on whatever you order. Not much time is left, it would be better to start looking for the options you have. Rakhi, which otherwise is a strand of thread, is supposed to bring good luck and protect the brother from everything bad. Well, we might not believe in all these, but the emotion attached with it can never be denied. To make this occasion of rakhi more special, get some exciting gifts for your brother. Be it the rakhi, chocolates, watches t-shirts, jeans or smart wallets, you can get all of it online. What better way to shop, but online. We have coupons for all kinds of Raksha Bandhan gifts for brothers. Check this page for all the Raksha bandhan offers. Get a beautiful rakhi and gifts for your brother on discount. Brothers too can grab really exciting offers and Raksha Bandhan discounts and deals on gifts that they would be buying for their sisters. You can also get big cashback offers on all categories such as electronics, fashion, accessories, beauty products, jewelry books and much more. Few more weeks are left of Raksha Bandhan. Make use of it to shop for your sibling(s) and save at the same time. Be wise and use the Raksha Bandhan deals that we have lined up for you. Shopping would never again be a burden for you, that is what we promise. Check this page for all the offers and deals. We keep the list updated and we will be adding more such coupon and discount codes in the coming days. Brothers and sisters are like those fighting jets but their love is eternal for each other. GrabOn decided to help your celebrate this special bond of brother-sister with special coupons. This Raksha bandhan buy anything and everything for your beloved brother or sister and use our coupons to save on all those super gifts. Go all out with your love and show how much they mean to you by giving them personalized and customized gifts. You can also save on all those purchases using our coupons. You can thank us later. Happy Raskha Bandhan to all you bhaiyas and didis.